Los Angeles California was first colonized by the Spanish pobladores in 1781 by order of the Spanish Crown. It’s population at the time consisted of 11 families numbering about 44 people. As time passed Los Angeles was a pueblo that had slow but steady growth. By the time that America won the Mexican-American War in 1848 there was a large influx of people moving westward. Two years later, the population of Los Angeles was about 1,600 people. By 1880 the population grew tenfold to 11,000. By the early 1900’s, the population of Los Angeles grew tenfold once more to just over 100,000 inhabitants. This quarter, the 3rd year students of Landscape Architecture of CalPoly Pomona are looking at the effects of the LA Aqueducts. The students are investigating the many aspects of the creation of the aqueducts. 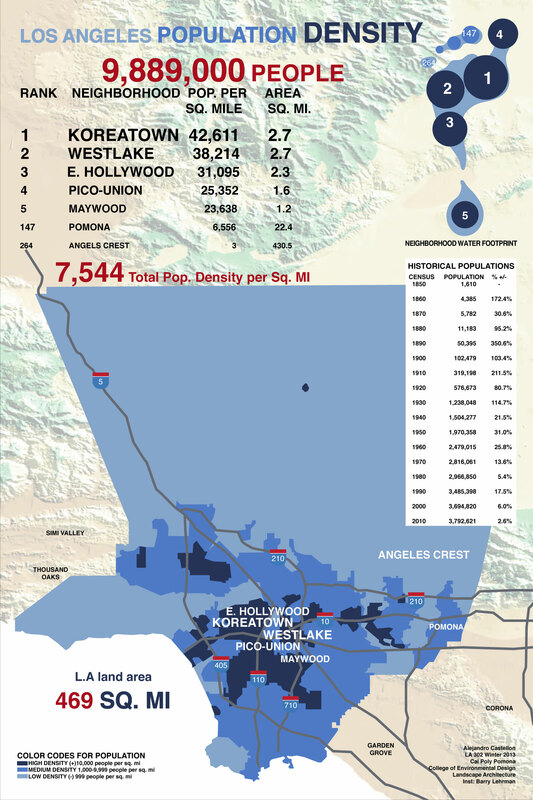 One of them being the large population that has sprawled in a place that can’t sustain the amount of people that thrive there and call Los Angeles their home. That was the focus of my investigation. As the nation grew, so did the city of Los Angeles. But what made all this possible? Water. Mulhollands engineering genius brought Owens Valley water to Los Angeles. It wasn’t until I started to delve deeper into the history of Los Angeles that part of its true history began to unravel. The City of Angels, as it has been nicknamed, is a world leader in entertainment, culture, fashion, media, science, education and business. It is ranked the third richest city in the world. But its growth, diverse population and power could have never existed if it where not for its dependence on water from the north. ← Its a bird, its a plane, its a… Dust Cloud!